MP4 Project Final Report: "Making Places Profitable - Public & Private Open Spaces"
During the summer of 2012, I was invited to bid for a piece of work to produce the layout of a final report for a division of Sheffield City Council - the South Yorkshire Forest Partnership (SYFP). SYFP has been heading up a series of projects involving a number of European partners, and one of them, the MP4 project, was drawing to a close. The final report and standalone policy documents to be published by the project team would be available online, in hard copy and via email to over 2,500 recipients in six different countries. It needed to look good! Luckily I was awarded the contract and began working immediately with the project manager, Sara Parratt-Halbert, and the communications officer, Sarah Poulter. They had a very clear idea of what they wanted to achieve, which was great for me, but some very tight deadlines which needed to be met to satisfy the project funding body. The document needed to have instant impact to reflect the success and scope of the project, in order to lobby politicians at local, national and European level on the benefits of using innovative approaches to plan, design, create and maintain private and public open spaces. It also needed to project a professional image, being visually appropriate for the target audiences of agencies, authorities, investors and politicians. I came up with three alternative layout designs, using the new MP4 website design as a base, the project team made a choice, and work began. We rescheduled some of the tasks in order to meet changing timescales, and I was able to provide first drafts of the policy documents ahead of schedule. Meeting up regularly with the project team, and keeping in close email and phone contact with them throughout the process, I was able to make all their amendments and complete the final full set of documents within our deadline, including creating a set of template documents for use by some of the other partner countries for their translated versions. I also took Sara and Sarah to meet the printers, The Print and Design Factory, who were amazingly helpful as always with suggestions for different stock weights and finishes, to give the report the perfect look and feel. We even got a tour round their print works! I was able to make use of some beautiful photography to illustrate the report, including the stunning cover image, and the final document looks great! Once the report had been signed off, I used an online newsletter app, Campaign Monitor, to design a bespoke email with links to the report, and issue it on behalf of SYFP to over 2,500 subscribers. Success - a job well done! 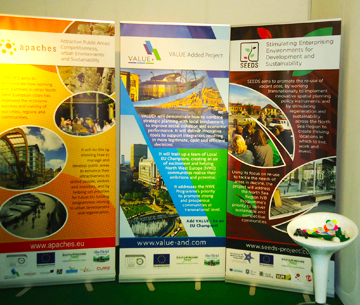 SYFP got back in touch with me a couple of months later to tender for another piece of work to produce leaflets and display banners for a national Ecobuild exhibition in London. Again, I was lucky enough to win the work, and produced a suite of leaflets and roller banners for three of their other ongoing projects highlighting different aspects of utilising green and vacant space for the good of the community. 'MP4: Making Places Profitable' has been a five-year long project focusing on innovative approaches for planning, designing, maintaining and using private and public open spaces. Nine project partners in six countries have been looking at how 'place-keeping' (improving open spaces) can offer positive social and economic benefits.